I have been in an oolong state of mind though I've been drinking a variety of teas such as sheng, breakfast blends, jade and silver needle teas, matcha and other Japanese green teas. 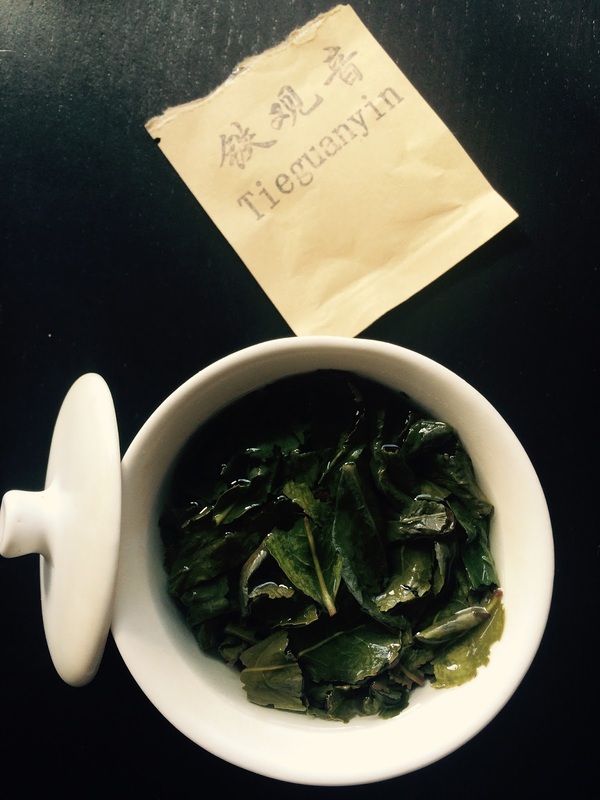 Today I'm sharing my notes on tieguanyin from Tea Ave, Verdant Tea, and Yunnan Sourcing. I do not attempt to compare and contrast the teas, but if you have drunk any or all of these teas, I welcome your thoughts in the comments. 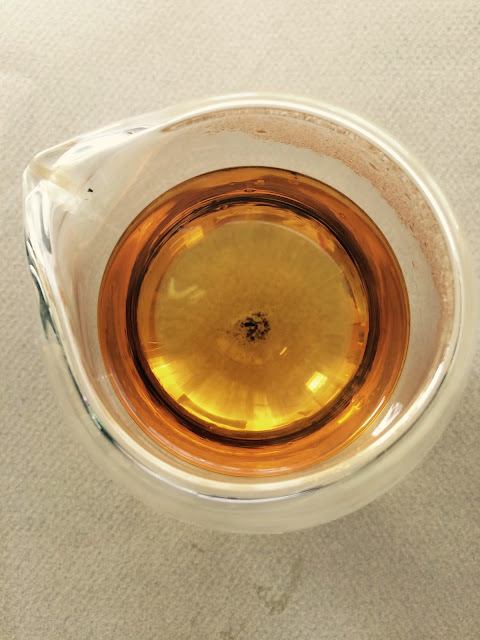 The first of the tieguanyin I drunk was the Autumn 2015 Imperial Tie Guan Yin of Anxi Oolong Tea of Fujian from Yunnan Sourcing. 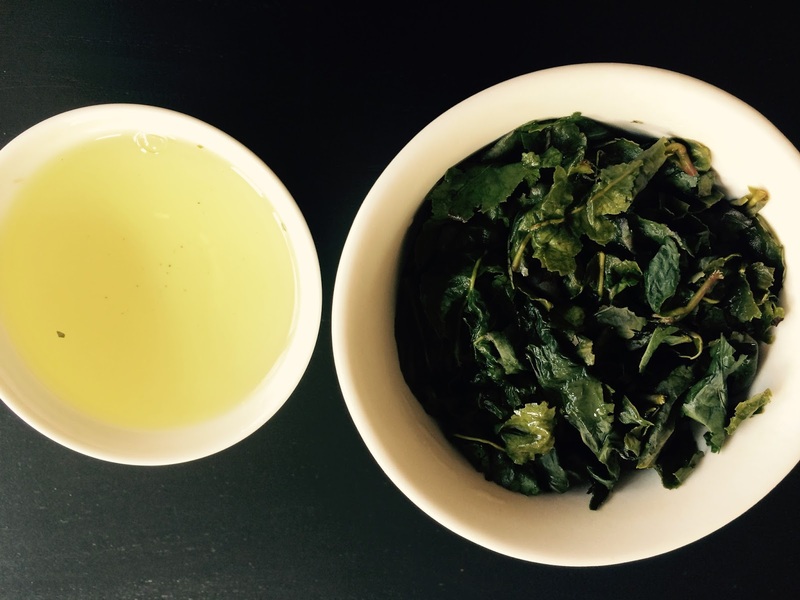 It was one of three teas in the January 2016 Jade Club box. The pouched contained 25g and I prepared it using my gaiwan, 4-5g per session, and 185-195F water. Typically I got eight infusions and then would cold steep the leaves overnight. The dry leaves smelled of creamed spinach and orchids, at least I think the aroma was of orchids. It was definitely floral. The tea was a combination of dark and vibrantly colored green leaves. After a brief rinse, the leaves smelled sweet and floral mixed with the sharp scent of freshly mown grass. The rinse water smelled like salt water. This happened when I rinsed the leaves in 195F water; I think this temperature is too hot for TGY. Dropping down to 190F water, and a steeping for 30s, the liquor was beauty then sweet, floral, and silky. The second infusion with the same parameters was all sweet, floral, creamy, and stained my cheeks. I bumped up the water temperature to 195F and the marine flavor popped up but was quickly replaced by classic TGY as the liquor cooled. It was super floral. The fourth steep with 190F water for 30s was less silky and had a slight stone fruit finish. The fifth and sixth steep followed the same parameters. The color of the liquor lightened, the silkiness receded, the mouthfeel was cleaner still with floral notes but the fruit finish was more pronounced. At the seventh steep, the floral notes were present but the the liquor was fruitier with a bit of a dry finish. I dropped the water temperature to 180F for the eighth steep and yielded vegetal notes alongside a slight fruitiness. The silky mouthfeel had disappeared and the liquor was clean tasting. The Tie Kwan Yin from the Muzha district of Taiwan by Tea Ave was the second tieguanyin I drank. It was part of the Mountaintop sampler I ordered as part of my new year's aspiration to discover and explore more tea. The pouch contained 8g and recommended 2.5g in 90-95C water starting with a 3m infusion for a gaiwan session. There was not a striking aroma to the dry leaves. The first infusion tasted like an iri-bancha with a sweet finish! The wet leaves felt silky. The second infusion was 10s longer -- and each subsequent steep time was increased by 10s -- and yield a liquor that was peach juice colored with a more robust flavor. It still reminded me of an iri-bancha with a sweet finish. The aroma was floral and as the liquor cooled it too tasted of flowers. The third infusion was still incredibly floral but the mouthfeel has thinned. The experience was the same for the fourth infusion with a noticeably decline in flavor between it and the fifth infusion. During another session I used 200F water and 5m as the parameters for the fifth steep and the liquor yielded a bit more flavor. In addition to the Tea Ave Mountaintop sampler, I also ordered the Five Teas for $5 sampler from Verdant Tea, which contained a Tieguanyin from Daping Village, Anxi, Fujian. The dry leaves were a beautiful color like an emerald from Colombia. I used the entire sample which I believe was 7g. The water temperature varied between 195 and 185F. The first infusion of 30s was light in flavor and color. The second and third infusions of 40s and 50s, respectively, were incredibly aromatic and the liquor was a grassy green. The liquor caused a tart sensation like that of eating an unsweetened cranberry or cherry. The fourth infusion of 60s was less aromatic but the tartness was still there in my soft palate. It was a delightful note. A mineral note emerged. The fifth steep of 70s was a balance of floral and sweet notes with no outstanding flavors. The final steep was 2m. I cold steeped the leaves overnight and those floral flavors were front and center in the liquor. The fourth tieguanyin I've been drinking is also from Yunnan Sourcing -- it is the Light Roast Premium Tie Guan Yin Mini Tuo Cha Anxi from the February 2016 Jade Club. With this tea, it was my first time drinking an oolong tuo. I have prepared five of the ten tuo. I will share my observations from my first two sessions. Session 1 steep 1 was 40 secs. The tuo opened up completely and the liquor was clear. Steep 2 was 20s and yield a roasted sweet potato flavor and a light apricot color. The third steep had a silky mouthfeel with a tart sensation in my soft palate but also floral and sweet. The liquor color was much darker than the previous steep. This was a tasty cup of tea! Steep 4 was 30s and the leaves smelled like caramelized grains. The flavor profile was the same as in steep 3. The fifth and sixth steeps were 40s and 1m, respectively, and the liquor was tart, tasted of roasted vegetables, but was not as sweet as prior infusions. For the second session, I rinsed the tuo for 5s. The first and second steeps were 30s long with subsequent steeps 10s longer. The liquor from steep 1 was tight. The liquor from steep 2 was mild tasting initially but as the tea cooled, a tart sensation and a roasted sweet potato flavor emerged. I write, "Wow!" while drinking the liquor from steep 3. There was a surprising lilac flavor. The tart sensation was still present and the liquor tasted like roasted vegetables. Steep 4 yield a floral, slightly roasted liquor with a hint of tobacco. The leaves smelled of charred broccoli. I didn't record notes for steep 5. I increased the water temperature to 200F and the infusion time to 2m for steep 6. The liquor was all mineral and stone fruit. Don't discard your tea leaves once the flavors from hot infusions have declined or disappeared. One thing I did with all these teas was to cold steep the seemingly spent tea leaves. I was always rewarded with a delicious glass of tea the next day. It is nice to know more about Tieguanyin Oolongs, this would be one of those healthiest oolong tea.